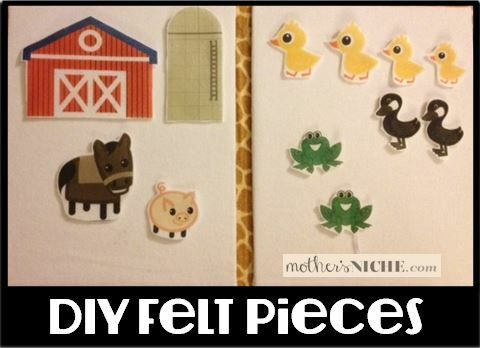 Felt Pieces: How to Make Your Own! March 11, 2013 By Tina M 31 Comments This post may contain affiliate links. Read my disclosure policy here. I have fond memories of the felt board and felt pieces that I grew up with and was wanting to buy some flannel board stories recently. I never knew how expensive felt pieces are! Even the set I found on Craigslist was over $100! After doing the iron-on onesie designs, I decided to use the same T-shirt iron-on transfers to make my own felt pieces! I’m super giddy and thrilled at how perfectly they turned out, because this opens a whole new world of possibilities for the different felt characters and images I can make. 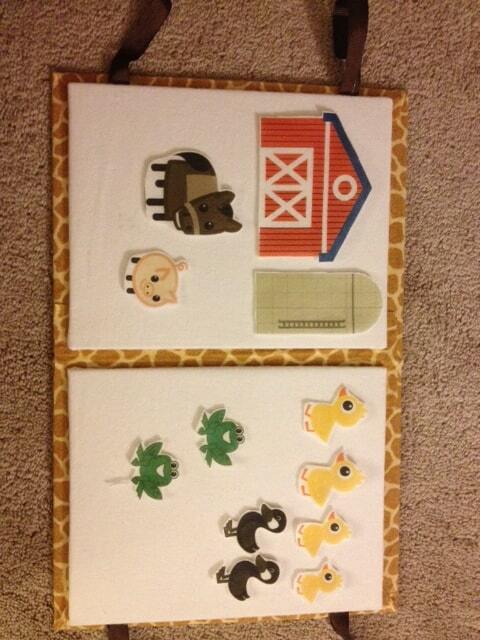 I made these cute farm felt pieces using my printable quiet book pdf, and then just ironed them onto felt. It took probably five minutes! Now I have cute felt pieces to go in my portable felt book! Just make sure that if you are ironing on an image with letters or numbers that you remember to reverse the image! I forgot that the pigs had numbers on their shirts so I skipped this step (the numbers are backwards). Use the snipping tool to copy and paste as many images to one page as possible so that you don’t have to use as many transfer papers. I try to leave as little white space as possible, giving me more felt pieces per page. What an AWESOME IDEA!! 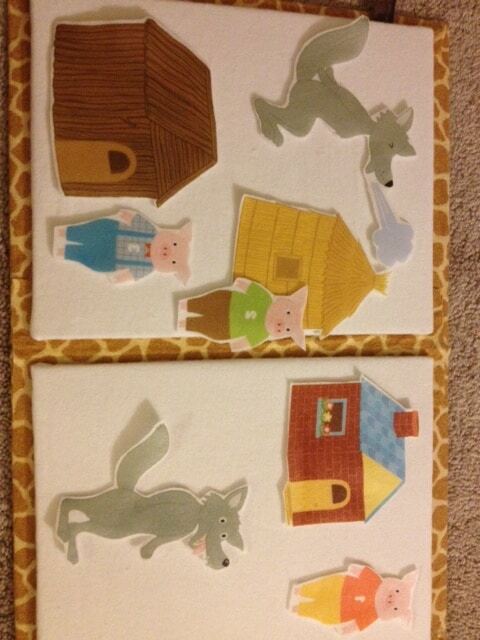 I have wanted to make my boys a felt book for years but didn’t have time to make the individual pieces. Thanks Chrissy! I’ve been wanting to make felt pieces for awhile too, but like you never found the time. This is SO FAST and easy. omg that’s the cutest thing I’ve ever seen. consider yourself pinned. Awesome idea! I will have to try this! What a wonderful idea!! I’m going to have to give this a try. I know my little girl would LOVE having some felt sets to play with. I’d be thrilled if you’d link up at this week’s Off the Hook! wow, fun idea!!! Yes, this reall open up what can be put on felt! I’ve been wanting the make a felt nativity advent calendar but was overwhelmed but creating the people… now I can just find the graphics online… pinning!! What a GREAT idea! I will definitely be trying this to add to our Sunday bag. Thanks for sharing! I may do this with my youngest, in face maybe my daughter and I will do it with my youngest. Thanks for sharing!! I’m visiting today from Linkin’ with my Ladies. Do it Rosey! They are so fun and easy to make. I LOVE this. I can’t believe what kind of options these felt characters will open up for my kids. I recently started a Thursday link-up party (yes, today:), and I would really love to see this post and/or any others you would like to include. I am at allthingswithpurpose.com. Hope to see you there and for many more Thursday’s to come!! Oh my goodness, this is gold! I am totally pinning so I can do it later. I would love to do the scripture ones & I am off to check out your quiet book right now, my son needs it! Uh, SMART!! What a great idea! I was first introduced to felt boards in Sunday school back in the 40’s. 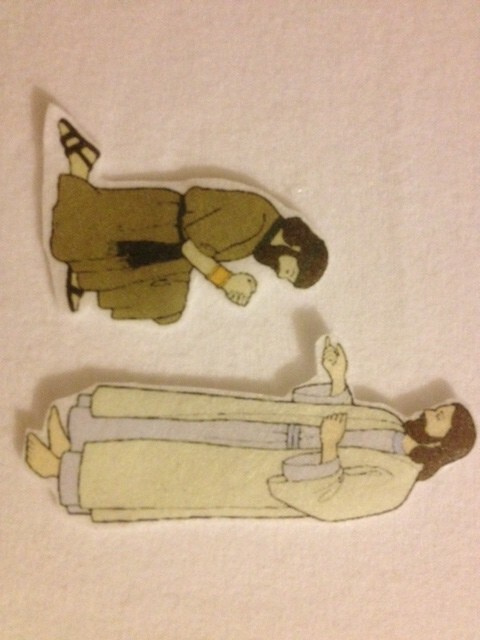 I used to love it when our teacher told us Bible stories using simple pieces of felt. She would choose someone to help her and i always had my hand in the air. Thanks for reminding me. I remember Flannel Boards being used when I was a kid – I went to some sort of Bible Lesson every week that was held at my school. I wanted my very own Flannel Board! This is a great idea. Wow, you are so creative! That was amazing! 🙂 How fun to create it yourself! My kids used to love to play with their felt board! Kept them busy for a long time, lol! Oh wow, my son would LOVE this! …and who knew how easy this could be?! Thanks for coming by to link up up at Sharing with Domestic Superhero Thursday Link Party! I love this so much! I hope to see another project this thursday!! Thank you so much, I will try this in my preschool. I love your idea, I’m just having a hard time figuring out how you get the designs on the felt…? Hi, I have really been wanting to do this. Any tips on not screwing up? I ordered a different type of sheet and had a lot of trouble with transferring. Thanks for any tips.